I arrived at Bears Den Lodge, just past the 1,000-mile mark on the Appalachian Trail, at high noon on July 2, 2016, a pleasantly warm, sunny day. To my dismay, I found that I would not be able to pick up the box I’d mailed to the hostel until 5 p.m.
Grumpy about missing out on the perfect hiking weather, I offloaded my pack, “showered” under an outdoor pump, and fell asleep on the couch in the hostel’s unlocked basement. At around 4 p.m., I woke to the creaking of the screen door and saw a familiar hiker, followed by a much older man, bearded and solemn. “Hey, man,” I said. I was puzzled to see him, since I’d just gotten back on trail after an enforced five-week break to take care of work and family obligations. He should have been hundreds of miles ahead. Turning to the man, who was dressed in grungy work clothes, Joker said, “I’m going to come back when I’m finished. I mean it.” They exchanged a long embrace before the man drove off in a grumbly, battered pickup. The Yellow Deli restaurant in Rutland, VT. A.J. Matthews/The Trek. When I asked how his hike was going, Joker told me he’d injured his ankle and spent the last month working at the Stony Brook Organic Farm in Hillsboro, WV, run by a religious group known as the Twelve Tribes. The group is well known among AT hikers for offering cheap (even free) lodging at the farm and its hostel in Rutland, VT, and for the food at its Yellow Deli restaurants. I heard later (but was unable to confirm) that Joker wound up spending many weeks at the group’s hostel in Vermont as well. Having encountered Twelve Tribes members in my hometown, Boulder, CO, I had a feeling I knew more about the group than Joker did. For many years, the group has practiced a kind of passive evangelism, setting up businesses—hostels, organic farms, Yellow Deli restaurants—in 13 countries, focusing on locations where it will attract young, often wayward, people, including the AT (Rutland, VT; Lancaster, NH; and Hillsboro, VA); Continental Divide Trail (Abiquiu, NM, and Boulder, CO); Pacific Crest Trail (Valley Center, CA) and the Camino de Santiago (Spain). Turkey near the AT in Shenandoah National Park. Just because. Clay Bonnyman Evans. There’s no way to know how many recruits, if any, the Twelve Tribes has gleaned from its hiker-outreach efforts. Women should be subservient to men; their primary purpose is child-bearing and -rearing. Corporal punishment is essential to raising children. “The rod expiates — takes away the guilt from a child’s heart,” Spriggs wrote in 1990. Lying is permissible for Twelve Tribes members. The group, which claims a worldwide membership of “somewhere between two and three thousand,” has been subjected to police raids in Germany, Vermont, and elsewhere, following allegations of child abuse and violation of child-labor laws, and individual members have been arrested for child abuse, pedophilia, and even child murder, notes Joe Hawkins, who briefly attended meetings of the group in Winnipeg, Canada, with his wife, who soon left him to join the community. But many hikers, particularly women, have come away feeling uneasy about what lies beneath the hospitality under a Twelve Tribes roof. Tonia Alford, aka Tambourine, who hiked the trail in 2007, stayed at the group’s Rutland hostel. In the era of #MeToo and an ever-widening partisan chasm, many Americans, at least, have become comfortable with boycotting businesses or organizations whose owners or leaders don’t comport with their ethics, morals or beliefs. But many hikers clearly take an agnostic view of the group, judging it solely on their personal experience at a hostel, farm or restaurant. But others say the group is not only free to practice its beliefs, but is also not that different from many more mainstream religious groups. The internet was instantly aflame with cries of hypocrisy and “chickenhawk” in the “not me generation,” and the poll certainly seems to paint an unflattering portrait. What surprises me is that anyone is surprised. First, young people resisting the idea of interrupting their lives to go into a war zone isn’t an anomaly; historically, it’s the rule. But more important, government and society have trained this generation to see war as something other people do. Tens of millions of Americans born since the late 1980s have grown up in a country almost perpetually at war — with the exceptions of 1997 and 2000, some kind of military action has been under way every year of their lives. They have experienced war as dirty work other people have to do: Less than half a percent of Americans now serve in the military. Perhaps worst of all, they have been trained by politicians to look the other way, go shopping, pay no attention to the flag-draped coffins hidden behind a curtain of cynical censorship drawn by those same politicians who don’t want anyone to know about war’s consequences. These “chickenhawk” millennials are really no different than the people now leading the country. Republican elected officials and presidential candidates are full of hollow bravado about how to handle the Islamic State, willing to hint at using nuclear weapons — “I don’t know if sand can glow in the dark, but we are about to find out,” said Ted Cruz — or sending in ground troops (almost all of them). Nobody in the GOP or Democratic presidential field served in the military. In all of U.S. history, just 11 presidents have not served in the military, some serving in state militias rather than federal forces. The longest drought ran from 1913 (Wilson) to 1944 (Roosevelt). Today, just over 20 percent of members of Congress have served, compared to a peak of 77 percent in 1977-78. And just 7 percent of the population are veterans, compared to 13.7 percent in 1977, a drop by almost half. Heinlein’s novel imagines a future in which only those who have served in the military may vote. veterans, instead of “anyone who is 18 years old and has a body temperature near 37 degrees (Celsius).” But under the Constitution, there is no requirement that one must serve in the military to be elected to office. And certainly, a history of military service doesn’t inoculate a president from making dubious (and worse) decisions about war — Kennedy, Johnson, Nixon and George W. Bush all come to mind. One who didn’t, Franklin D. Roosevelt (he did try to resign as Secretary of the Navy to enlist during World War I, but President Wilson refused) arguably remains the nation’s greatest war president. Still, President Dwight D. Eisenhower was surely right when he fretted privately(according to one of his daughters) that non-veteran presidents would be too easily manipulated and steamrolled into bad decisions by military advisors and that the increasing entanglement of business and war, the “military-industrial complex,” would likely result in ill-conceived wars. It’s probably true that a massive-scale mobilization of American troops — consisting mostly of other people and other people’s kids, of course — could, like Tito in Yugoslavia or Saddam Hussein in Iraq, rout the Islamic State and hold the area in some semblance of order through sheer power. But such an occupation would have to be all but indefinite, because as soon as those troops leave, the old Sunni-Shia and other historic, even ancient, antagonisms will fill the vacuum. Mission creep would be hard to avoid. In other words, the fondest wishes of chickenhawk millennials and politicians would have terrible costs, counted both in blood (of “other people’s kids”) and treasure: Some military experts think 100 troops killed, 500 wounded and $10 billion a month would be all but guaranteed, and it might be even worse. As Tolstoy asked, what then must we do? Although generals and politicians hate the idea, and 74 percent of Americans say they oppose it, the nation should move away from an all-volunteer force, perhaps via a national-service requirement that includes a military lottery and no loopholes, except for the truly disabled, as in Israel and Switzerland. (There would have to be non-military options, for moral reasons and because the U.S. military doesn’t need that many bodies). How would this help? Here’s a rather long essay on the subject, but in short, the all-volunteer force is dangerous. It has led to a growing separation between the troops and civilians, with many in the military believing that they are superior citizens and non-military Americans the dupes of cynical propaganda campaigns leading them to proclaim all who serve are “heroes” — virtually all active-duty military and veterans openly mock this idiocy, and they should know — and thinking that clapping for soldiers in airports or slapping a yellow ribbon on the SUV somehow constitutes “support.” An all-volunteer military leads to more war, and whatever the shortcomings of mandated service, it will give a broader swath of the public pause when we are called upon to blindly support the next war. In addition, we need politicians with spines stiffer than wet spaghetti. The current scheme, under which Congress ignores its obligation to declare war under the War Powers Resolution of 1973 and presidents of both parties relish their all-but-unfettered freedom to wage war, is dishonest. Members of Congress are too chicken to take an actual vote, fearing future repercussions, thereby ceding enormous power to the executive. From there, I propose a law mandating across-the-board tax increases on all individuals, businesses and corporations — again, no loopholes or deferments, and no more putting wars on national credit cards — once troops have been in a theater of war for 90 days, to pay for all costs stemming from the conflict, including top-notch medical and psychological care for returning soldiers. It’s past time to rip Americans who have not served in the military from the appalling, comforting, false belief that they need make no sacrifices for the wars they have been trained to cheer. It’s easy to point a finger at Millennials, but the undeniable truth is that most Americans do the exact same thing. I’m still thinking about the trail throughout the day. When I asked my friend Sparkle, who completed the trail with her dog Jude in 2014 and was my original inspiration to walk the Colorado Trail, when this would stop, she just laughed. “I still think of it pretty much every day,” she said. I’ve bought some books about other long trails, the Appalachian, Continental Divide and Pacific Crest trails, specifically, and I hope to at least be able to do some sections next year. Maybe part of the AT in spring, then do all the CDT in Colorado that I haven’t done yet. We’ll see. Essential “non-essential” gear. I had a snotty attitude about certain pieces of gear before setting out, particularly trekking poles, which I was pretty sure I’d only ever seen being used by suburban hausfraus out for a three-mile day hike wearing too much perfume. But on Sparkle’s insistence, I borrowed a pair of Leki poles (from a former suburban hausfrau, as it turns out: me mum, though thankfully she’s not a perfumer) and I would never, ever thru-hike without them again. Poles allowed me to use my upper body to a small degree when climbing and eased the impact of going downhill and stepping off rocks. I was also pretty sure that I’d toss my battered 12-year-old Mountain Hardwear rock gaiters — extra weight, you know — but I consider gaiters indispensable on the trail. Every time I saw a hiker parked by the side of the trail unlacing his or her shoes to dump out a rock or stick, I was grateful. Durango was depressing because all the sudden I was dumped off the trail into this city with no obvious gathering place for hikers (like, say, the Raven’s Rest in Lake City). I didn’t know about the tradition of a free beer at Carver Brewing Co., but even that wouldn’t have lasted long enough for me. Shortly before going on the trail, I read David Gessner’s excellent book, All the Wild That Remains, a mashup of bios about Edward Abbey and Wallace Stegner and Gessner’s own thoughts about the natural world of the West (read my review here). I love this advice from the book: “Walk alone in the desert for ten days or go live on a barrier island for a while or even camp in the backcountry with bears. 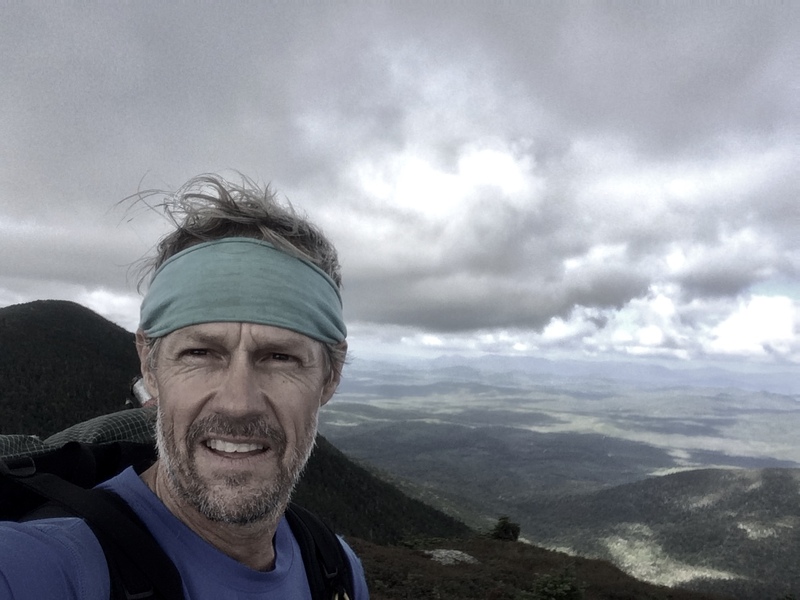 Not because you are going to film it or make a YouTube video about it but because of the experience itself.” When my iPhone drowned in a deluge on Segment 21, I actually became even more in tune with the trail. In addition, while part of me desperately wishes it could simply push “play” and run the whole adventure like a movie in my mind, I think much of the poetry of the experience is that it is ephemeral. The trail is a lesson in non-attachment, before, during, and after. I will say again that wearing Hoka One One shoes on the trail was perfect for me. I foolishly started with a pair that already had 400+ miles on them, but switched them out at Breckenridge. Early generations of these shoes fell apart way too quickly, but after nearly 400 miles from Breck-Durango, mine had suffered some minor external tearing on the uppers, and that’s it. Padding … ahhhhhh….. While buying the new pair of Hokas at Vertical Runner in Breck, the young woman who helped me recommended Swiftwick socks. I’ve always thought socks are pretty much socks, though some wear out faster than others. I’m here to say that Swiftwick socks are amazing. They are durable, lightweight, and they wick better than any socks I’ve ever run or hiked in. Also a shout out to my REI Quarter Dome 1 tent and my Therma-Rest Z-Lite pad, which rescued me from the hideous disaster of the Klymit Static V pad I dumped in Breck. Hated that thing. Product endorsements over. I did not receive any compensation for these plugs. page to let everybody know not to be afraid of the pistol he would be packin’. I didn’t meet him, but I met others who did, and basically, he did the same thing on the trail, barging into camp waving his gun around (although now he was claiming that “my wife made me bring it along, for bears” — maybe he got the hint that nobody was impressed?) To me, if you start down the trail in an attitude of fear, you probably aren’t going to have much fun.I loved being out of touch, not knowing what was going on in the world. And I learned that I really am a loner — except when I’m not. I loved meeting hikers in town, and threemonths later, I feel bereft of that community. I also quite literally find myself skipping showers for a couple of days in a feeble effort to recreate something, anything, from the trail. But itchy scalps and blackened fingernails don’t do the trick. I miss it. But that, too, is part of the experience. KNOXVILLE, Tenn. — The remains of 1st Lt. Alexander Bonnyman, Jr., arrived in Knoxville from Hawaii Sept. 25, bringing his family’s 72-year odyssey closer to conclusion. The remains of 1st Lt. Alexander Bonnyman, Jr. arrive in Knoxville, Tenn. on Sept. 25, 2015. Photo by Jeremy Edward Shiok. Bonnyman was killed on Nov. 22, 1943 in the Battle of Tarawa. He was posthumously awarded the Medal of Honor. His remains, along with those of hundreds of other Marines, were lost after they were buried on Tarawa following the fighting. His parents, Alexander Bonnyman, Sr. and Frances Berry Bonnyman, spent years trying to learn the location of their son’s remains and have them brought to Knoxville, where he grew up. Others, including his younger brother, George Gordon Bonnyman, and daughter Frances Bonnyman Evans, continued the quest for decades without success. “I do want my son’s remains returned to Knoxville, Tennessee. … If any further or additional request or advice is needed to insure (sic) his remains being returned to me here, I shall appreciate your writing to me,” Alexander Bonnyman, Sr. wrote to Marine Commandant Lt. Gen. A.A. Vandegrift in 1944. In 2007, Mark Noah, founder of History Flight, Inc., began researching the long-lost graves of Tarawa. The Florida-based nonprofit group began sending teams of field researchers to the island of Betio, where the battle took place, in 2008., An archaeological team led by Kristen N. Baker located the site of Cemetery 27, where Bonnyman and 39 other Marines were recorded as having been buried, in March. When the team concluded its work in July, it had recovered 35 sets of remains from the island. Alexander Bonnyman, Jr. was born May 2, 1910 in Atlanta. He was raised in Knoxville and attended Princeton University. He was living in Santa Fe, New Mexico and operating a copper mine near Santa Rosa when he joined the Marine Corps Reserve in July 1942. Lt. Bonnyman’s casketed remains will lie in honor at the East Tennessee Veteran’s Memorial, World’s Fair Park, Knoxville, Tenn. from 2:30 to 6 p.m. Saturday, Sept. 26, with a short memorial service from 2:30 p.m. to 3 p.m.
Lt. Bonnyman will be buried in a family service with full military honors and a flyover at noon, Sunday, Sept. 27 at Berry Highland Memorial Cemetery, 5315 Kingston Pike in Knoxville.